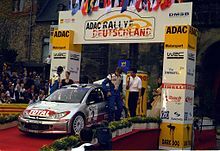 Marcus Grönholm at the 2002 Rallye Deutschland with Peugeot 206 WRC. Petter Solberg at the 2006 Cyprus Rally. Sébastien Loeb during the Rally Catalunya 2008 with Citroën C4 WRC. Sébastien Loeb at the 2011 Rally de Portugal with Citroën DS3 WRC. หน้านี้แก้ไขล่าสุดเมื่อวันที่ 1 เมษายน 2560 เวลา 03:57 น.